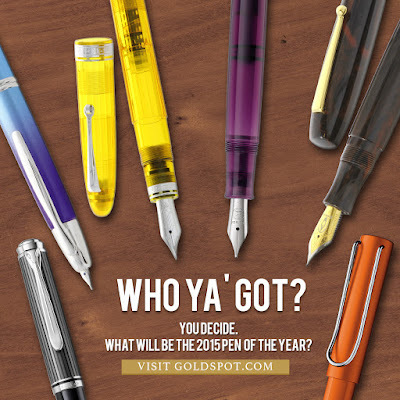 Today is Election Day 2015, and the first official day open for voting on the Goldspot Pens Readers' Choice Pen of the Year. Voting is currently open until Fountain Pen Day, Friday at 10am Eastern US Time. At that time, the polls will close and we will release the results later that day. Edison is our reigning, 4-time champion, but has some big-time competition this year with a flock of Pelikans and the TWSBI Eco to compete with. For the first time this year, we're also holding a separate contest for inks as well.